Greenhouse gas (GHG) emissions from agriculture are an important contributor to climate change, especially when emissions from agriculture’s impact on land-use changes are included. Importantly, agriculture emissions will become more significant in the future as the world takes actions to address climate change more broadly. To be clear, the majority of greenhouse gas emissions are caused by fossil fuel use, and the most important climate change action is and will remain keeping fossil fuels safely underground. This means society needs to focus on the energy sector in the near-term. But as progress is made in that effort, the emissions from agriculture and land use changes will become a larger share of the remaining emissions. In current estimates, agriculture represents between 10-15% of global emissions measured in carbon dioxide equivalent, while land use changes represent between 4-14% (World Bank, WRI CAIT tool). Energy use causes about 70% of emissions, and under business as usual that would grow to a larger share of an increasing total. But if the world is on a trajectory to meet the goal set in the Paris agreement – “well below 2 degrees C” over pre-industrial by the end of the century – then total global emissions will have to be lower, shifting the shares of GHG emissions from each sector. Under any successful scenario, agriculture will be a higher fraction of GHG emissions. Without reducing agricultural emissions, it will be much harder to achieve the Paris agreement goals.. Others have also noted the importance and potential of reducing agricultural emissions. Using a specialized version of Climate Interactive’s En-ROADS tool, we estimated emissions in 2050 under two different scenarios, shown in the graphs below. 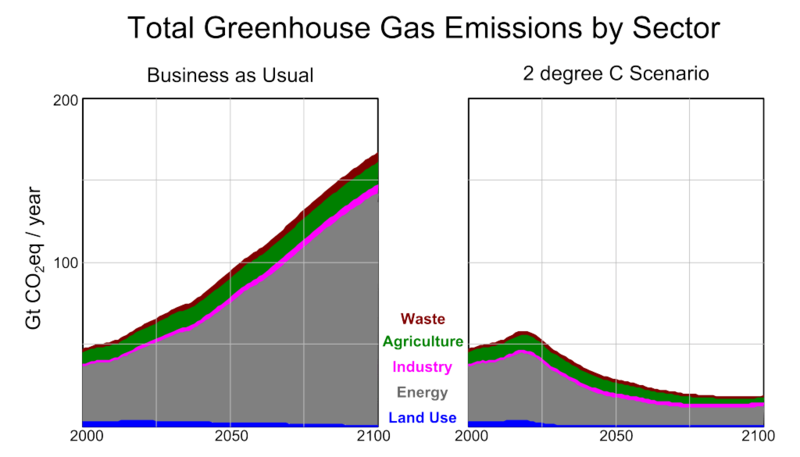 Under business-as-usual (4.5 degrees C warming by the end of the century) total emissions would grow above 90 Gt CO2 equivalent by mid-century, with energy use and agriculture production contributing 78% and 13%, respectively. But in a scenario that leads to 2 degrees C by the end of the century, emissions in 2050 would have to fall to under 27 Gt CO2eq. Energy use would cause about 60% and agriculture production almost 25% of this lower 2050 amount. After aggressive action on fossil fuels, lowering emissions from agriculture can be the difference between making and not making the Paris goals, up to four tenths of a degree under some scenarios. Emissions from land-use changes are also much lower in a 2 degree scenario. Land, soils, and biomass would actually be removing carbon from the atmosphere by the end of the century, offsetting perhaps 6% of the remaining energy emissions. Agricultural practices can contribute to soil carbon sequestration and agricultural efficiency can reduce pressure on land and possibly free up land for other uses. The amount of carbon sequestered in soils also becomes more important when fossil fuel emissions have been reduced low enough to be offset. Emissions are not the only reason to transform the agricultural system. The world will have a growing population to feed. Millions of people are aspiring to a better life, and agriculture will have to contribute to improved equity. Land will be essential for multiple priorities – agriculture may need to use less land to achieve competing goals for reforestation, halting land degradation, growing food and fuel, and supporting biodiversity. Agriculture will also need to transform and adapt to climate change. Even if we meet Paris’ temperature goal, and stabilizing warming to 2 degrees C, farmers will face new challenges. They are already seeing new patterns of rainfall and pests from climate change. So the transformation and adaptation of agriculture in response to climate change has multiple goals: more food, lower emissions, less land impacted, and more resilience. Africa can serve as a preview of the future. In Africa, energy emissions are low and agricultural emissions are a higher fraction of a lower base. Many farmers are vulnerable to extreme events. Agriculture in Africa has yet to experience the increased agricultural yields seen in the rest of the world, and countries have ambitions of growing the agriculture sector of their economies as well as increasing food for local consumption. Our project with Mohamed VI Polytechnic University is looking at how to accomplish growth and resilience with lower emissions through Climate-Smart Agriculture, which are farming methods that aim to accomplish the goals of higher production, lower emissions, and greater resilience in the face of increased climate impacts. Doing better at agriculture becomes more critical as we live in a world that is quickly burning through its carbon budget.